Two fortresses, guarded the Portuguese border with Spain: Elvas in the south and Almeida in the north. 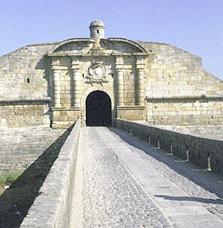 Almeida stood opposite of the Spanish fortresses of Ciudad Rodrigo and Fort Concepcion and its primary mission was to protect the crossings of the River Coa, which formed a natural barrier between Portugal and Spain. "The outline of the place is almost circular, and exactly fits the round knoll on which it stands. 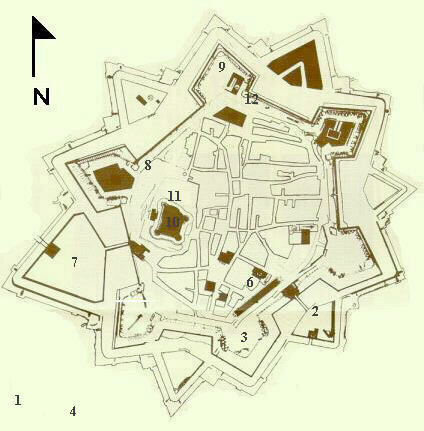 It has six bastions, with demi-lunes and a covered way. There is a dry ditch cut in the solid rock, for Almeida lies on a bare granite plateau, with only two or three feet of earth covering the hard stratum below. It was well armed with over 100 guns, forty of which were 18-pounders or still heavier. It had casemates completely proof against bomb fire, and large enough to cover the whole garrison." In mid-1810, the Anglo-Allied forces under Lord Wellington were deployed in the vicinity of Ciudad Rodrigo. Wellington knew that he was not strong enough to prevent the French from invading Portugal. If he attempted to defend the Portuguese frontier, he risked losing his numerically inferior army and the war. His plan was to stay forward along the border as long as possible, but once the French began to move, he would retreat to the Lines of Torres Vedras. There extensive fortifications were being built and he would have a secure supply line. The siege of Almeida began on 24 July 1810, when French forces under Marshal Ney, attacked General Craufurd's Light Division in what is known as the action on the River Coa. This attacked pushed the remaining British forces back across the Coa and Almeida was on its own. The French began to dig siege works on 15 August southeast of the town and despite heavy Portuguese firing by 26 August they had 11 batteries in place with over 50 guns in place. The French fired 6,177 rounds and used 9 tons of powder with little effect. They continued firing through the night when a howitzer round landed in the courtyard of Almeida's castle, where the garrison's main powder magazine was located. "According to a Portuguese artillery officer, 30 artillerymen were working in the magazine to transfer barrels of powder to the expense magazines on the ramparts so the great doors of the castle were open. The charged bomb rolled down the steps of the building into a subsidiary magazine and ignited 4,000 charged projectiles, which instantly ignited 150,000 pounds of gunpowder and over a million infantry cartridges." "The earth trembled and we saw an immense whirlwind of fire and smoke rise from the middle of the place. IT was like the bursting of a volcano — one of the things that I can never forget after twenty-six years. Enormous blocks of stone were hurled into our trenches, where they killed and wounded some of our men. 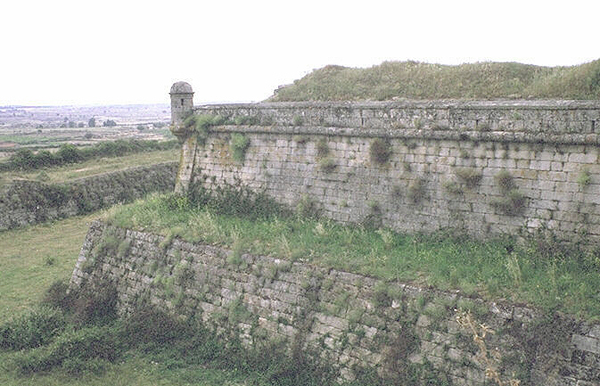 Guns of heavy calibre were lifted from the ramparts and hurled down far outside them. When the smoke cleared off, a great part of Almeida had disappeared, and the rest was a heap of debris." On 28 August, Almeida surrendered. The fortress that Wellington had hoped would buy him several months time, fell after a siege of five weeks. Within a month, the Anglo-Allied Army was in full retreat towards Lisbon. View from the WSW bastions looking towards the Coa River crossings. 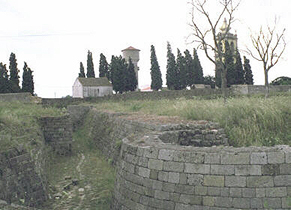 Sao Pedro Bastion, southwest of the main gate. Hills to the southwest where French siege works were. 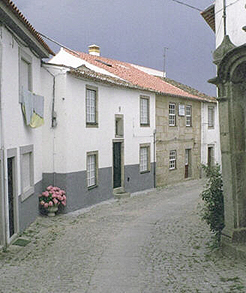 Narrow, winding streets of Almeida. Infantry Barracks opposite the main gate. Santo Antonio Bastion in western corner. 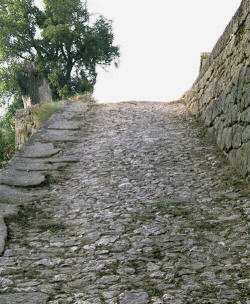 Ramp leading to the western parapet. Ruins of the castle destroyed by the powder magazine. Debris from the ruined castle. Tomb of Lieutenant John Beresford, a British officer of the 88th Regiment who died from wounds received in the storming of Ciudad Rodrigo in1812. 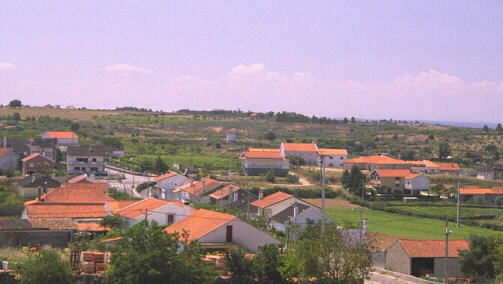 Almeida is small and maintains its character of 200 years ago. It is filled with narrow, winding cobblestone streets and the walls are in good shape. You can even climb down into the ruins of the castle. Walking the walls at night will give you the feel of how isolated the fortress is, for very few lights can be seen in the distance. From Ciudad Rodrigo go west on E 80 until the Portuguese border crossing station (about 17 kilometers) at Vilar Formosa. 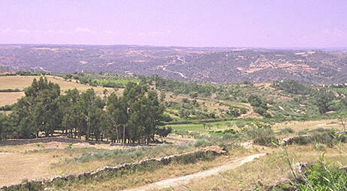 Just east of Vilar Formosa take Highway 332 north for about 15 kilometers until you reach Almeida. Horward, Donald (ed.) The French Campaign in Portugal: 1810-1811 An Account by Jean Jacques Pelet Minneapolis : University of Minnesota Press:; 1973. Horward, Donald. Napoleon and Iberia: The Twin Sieges of Ciudad Rodrigo and Almeida, 1810 London : Greenhill Books; 1994. Oman, Charles. A History of the Peninsular War Vol. III; New York : AMS; 1980. Rathbone, Julian. Wellington's War: His Peninsular Dispatches London : Michael Joseph; 1984.